Last November, evil Trump-supporting billionaire Joe Ricketts shut down Gothamist (and its sister sites) to punish its staff for forming a union. Now the sites have been acquired by a consortium of public radio stations including WNYC (NYC), WAMU (DC) and KPCC (LA), thanks to a deal brokered by the sites' founders, Jake Dobkin and Jen Chung and an anonymous donor who gave the public radio stations the money for the deal. Dobkin characterizes the acquisition as "the best possible outcome" following Gothamist's unceremonious closure, which infuriated much of the media industry. 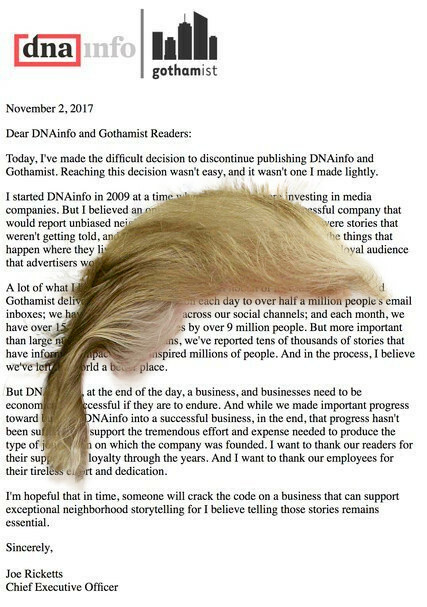 Ricketts' controversial decision to shut down the sites came months after DNAInfo acquired Gothamist, and just one week after the combined newsroom successfully unionized. As an added blow, Ricketts initially blocked access to the archives of both sites, replacing them with a letter announcing that he had turned off the lights.